Saturday, Apr. 13, 2019, 8 – 10:45 p.m.
For the Expand Upon series of staged readings, Mirror Stage commissions two local playwrights to each develop a short play responding to a community-selected theme, using the same multi- generational, multi-racial cast. 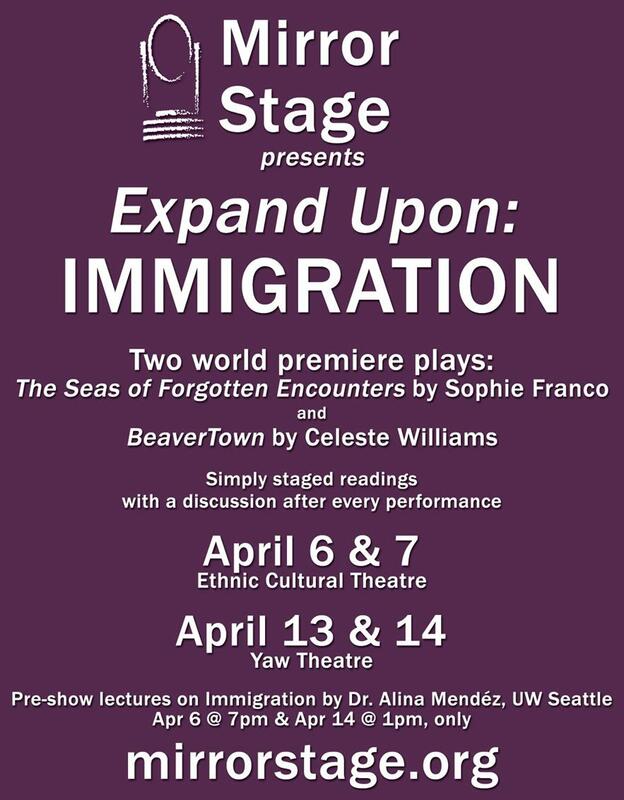 For the third round of Expand Upon, the community selected the theme Immigration, and Mirror Stage commissioned The Seas of Forgotten Encounters by Sophie Franco and BeaverTown by Celeste Mari Williams. Directed by Suzanne M. Cohen, Expand Upon: IMMIGRATION features John Bianchi, Michael D. Blum, Marquicia Dominguez, Eva Estrada Campos, Shahbaz Khan, Duygu Erdoğan Monson, and Mika Swanson. Performances will be Saturday at 8:00pm and Sunday at 2:00pm. Admission is $15; $10 for students and seniors. Every performance has 10 Pay-What-You-Can rush tickets ($1 minimum). There will be a moderated discussion following every performance. Dr. Alina R. Méndez will present a FREE pre-show lecture on Immigration in the US on Sunday, April 14 at 2:00pm. Yaw Theater is located at 6520 5th Ave S in the Georgetown neighborhood of Seattle. It is part of Equinox Studios Art Collective and is located in Studio 118 in The Factory. Keep an eye out for the golden eggs and house of sticks.